What if I told you that a poorly managed company spends around 7,500-10,000 person-hours every year, per $50 million worth of program management done for outsourcing and other purchases? Whereas, a best-in-class company focused on cost effectiveness, efficiency, cycle time, and productivity, spends only a fraction (1/5th) of that time? Vendor management is a necessary evil for organizations that are always on the lookout to reduce costs and increase efficiency. Key factors that deter organizations from reaching vendor management nirvana are long cycle times, large number of vendors, and quality of delivery, among others. These are ubiquitous to every CPO you speak with. The challenges are magnified in the PE world. Large portfolio of companies to manage, the pressure to increase the EV to EBITDA ratio, and a thin management layer, make it even more challenging for a Private Equity firm to manage its overall vendor footprint. Typically, a PE would cut down the costs as soon as it acquires a new organization. Most common cost optimizing techniques implemented are analyzing the spending patterns, relooking at vendor partners, renegotiating the existing contracts and tweaking the SLAs. The implemented optimizing techniques would yield results in any large organization, but the PEs face an uncommon challenge as most of their portfolio companies are sub-billion-dollar companies with revenues that can go as low as $50 million or less. Due to the small size of the portfolio companies, they neither have the scale of large organizations nor do they command enough attention from their vendor partners. Therefore, PEs face a specific set of challenges such as lack of management attention from vendors, absence of knowledge on latest technologies and rigid SLAs that do not favor small tech companies. A best in class PE plays to its strength and uses the experience of managing multiple portfolio companies. They enable collaboration among the companies, build a platform to share best practices, provide means to price comparisons, explore consolidation of similar services that bring scale and attention from vendors, and manage portfolio companies as one single large organization. These strategies are implemented successfully by very few PEs as things stand. In this part (I) of the blog series, we will delve into the challenges faced by PE firms in terms of vendor management, whereas in the next part we will explore vendor optimization strategies. Take a look at a few typical challenges that PEs and their portfolio companies face. Identifying the right vendor for the right job has always been a challenge for most organizations. Unlike major ones, that have an army of procurement executives for conducting vendor evaluations through RFPs / RFIs, smaller ones neither have the expertise nor the resources to assess and choose the right partners. Due to the limited number of partners in a PE, it is challenging for the portfolio company to get enough time and mindshare from them. 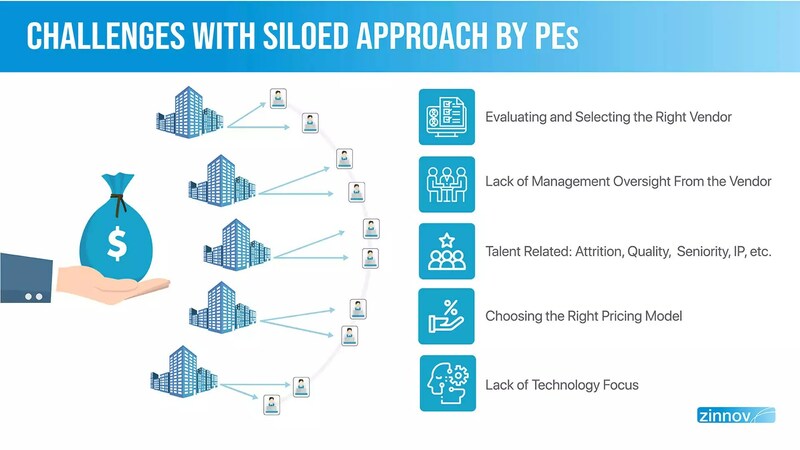 A PE’s management team might not have the required time for vendor evaluation, but they have the pool of companies, a few of which have the expertise in vendor selection process. There is a need for a common platform where all portfolio companies can interact and share the best practices, common pitfalls, and if possible, preferred vendor lists with each other. This enables the smaller tech companies to learn from their peer portfolio companies and pick the right vendor. A vendor always lays importance on strategic high value deals that involve 100s of FTEs, since an unmet SLA could break the deal. Such deals eat up most of the vendor leadership’s time, which limits the attention and value-add from the vendors to small deals. Small tech portfolio companies typically have low deal value or few FTEs, which typically don’t attract any time from the vendor management, and in a few cases, is very poorly managed. Reluctance to change in the scope, inefficient processes, no steps taken to cut down costs, low quality of work delivered are some of the challenges that portfolio companies face with their vendors. Facilitating a mechanism that enables periodic reviews of the efficiency metrics and cost reduction measures included in the vendor contract at the time of the deal, can prove beneficial. This provides the portfolio companies an upper hand in the deal along with clear visibility of the performance of the vendor as per SLAs. Talent plays a pivotal role in any engagement with a vendor since the very beginning of the deal. A thorough due diligence about the quality of the talent from the vendor and the specific skills that are required by the organization is needed before the contract is finalized. Quite often, vendors showcase talent who have worked on similar engagements; however, it need not necessarily mean that the same talent would work on the organization’s engagement too. This leads to a precarious situation where the client needs to rebuild the domain-specific understanding with the new team, while efficiency gains promised are lost, and quality takes a back seat. PE firms should also be aware of talent moving within the vendor organization to another engagement where a direct competitor is involved. This can potentially jeopardize the data security / IP of the client which pulls the PE firm into ugly IP wars. Clients need to ensure that they have the necessary clauses in the MSA (Master Service Agreement) to prevent similar moves from the vendor side. This gives more control over the talent that will be engaged to the client organization, and creates a stable team throughout the engagement. Another major factor that affects quality of the delivery is attrition of crucial vendor resources. Attrition of a key team member will not just reduce the quality and timeliness of the delivery but also the knowledge gained over a long period. Therefore, vendors are required to provide shadow FTEs and have a back-up resource in place with the necessary skills and knowledge transition (KT), so that neither the delivery quality nor the timeliness is affected. The MSA should contain a detailed plan from the vendor side to replace the attrition and cover details such as the number of days for replacement, KT procedure and shadow resource. The portfolio companies in question here are sub-million-dollar companies which are small and tend to work with large vendors. A pricing model that is widely used in the industry may not always be the best suited for such companies. These companies (owned by a PE) are typically very dynamic in nature, with a constant flux of ideas, management churns, and in a few cases, major technology makeovers, that are bound to happen during the course of the engagement. Such scenarios demand an equally agile and dynamic response from the vendor side too. Thus, common pricing-based models such as ‘fixed price,’ ‘time & material,’ or ‘outcome-based’ do not serve the purpose of the company. In such high-octane environments, PEs should also consider other options such as ‘pay by grade’ approaches where the billing is done based on the seniority or the skillsets required rather than a pre-determined model. Smaller companies tend to work on niche technology areas where finding vendors is challenging, as the universe of vendors to choose from shrinks considerably. After the right vendor is identified, it is hard to expect innovation and swift development from the vendor as they are not agile enough. They typically evolve at a much slower pace than that of the industry, while technology companies always want to be ahead of the curve. Also, due to small teams in the portfolio companies, they work on very niche technology solutions which are not viable for a service provider, as such niche solutions do not provide scale to them. Therefore, organizations should be well informed about the technical capabilities of the vendor before entering the engagement. PEs that have individual outsourcing contracts face a bigger challenge with respect to vendors as it becomes harder for portfolio companies to scale their outsourcing deals in terms of talent and value. Vice versa of this holds true as well – vendors are unable to provide the right attention to clients with smaller deal size. PEs would benefit if they consolidated their list of vendors across the portfolio companies to a smaller number to provide better quality of work. This way, both – the client and the vendor – are able to scale their business and reduce problems faced in the client-vendor relationship. As the number of companies increases in their portfolio, PEs need to be aware of the above vendor management challenges and ensure that a befitting mitigation strategy is implemented. Unlike other organizations, PEs have the necessary resources to share best practices, co-source, and consolidate their vendor partners with a single dashboard view of all the vital metrics. This drives out the inefficiencies and enables the PEs to play on their strengths, thereby increasing the EV of each of the portfolio company. In part (II) of this series, we will be exploring how a PE firm can co-source and/or consolidate its portfolio companies’ vendors in order to gain scale and efficiencies. To optimize costs and outline a consolidated vendor management system, write to us at info@zinnov.com.